Carvajal syndrome is characterized by woolly hair, striate palmoplantar keratoderma and left-sided ventricular cardiomyopathy leading to sudden cardiac death. It is inherited as autosomal recessive disorder due to defect in desmoplakin gene. Early recognition of the condition through cutaneous arkers can lead to early intervention thereby reducing morbidity and mortality. A 6-year-old male term child, born of second degree consanguineous marriage presented with thickening of palms and soles since 1 year of old. There was a history of recurrent fever with cough, loss of appetite, and exertional breathlessness for 2 months. Developmental history was normal. Past medical history and personal history were noncontributory. His younger sibling was normal. General physical examination showed tachycardia with a heart rate of 110/min. Cutaneous examination revealed focal hyperkeratotic plaques and papules over the palms and soles predominantly over the pressure points [Figure 1]a and [Figure 1]b. Palmoplantar hyperlinearity was noted. Facial examination showed fine scaling and multiple follicular papules on the scalp, forehead, eyebrows, nose, and cheeks. Exfoliation and cheilitis were present on the lips. Hair examination showed short, lustreless, and coarse woolly hair involving the entire scalp and eyebrows [Figure 2]a. Trichomegaly with outward turning of the eyelashes was noted [Figure 2]b. Nail and oral mucosa examination were normal. Systemic examination revealed gallop rhythm with pericardial bulge and epigastric pulsation. Hepatomegaly was present. Other systemic examination was normal. Complete hemogram showed microcytic hypochromic anemia with thrombocytopenia. Blood biochemistry profile was within normal limits. Ultrasound abdomen revealed hepatomegaly (liver span 11.4 cm). 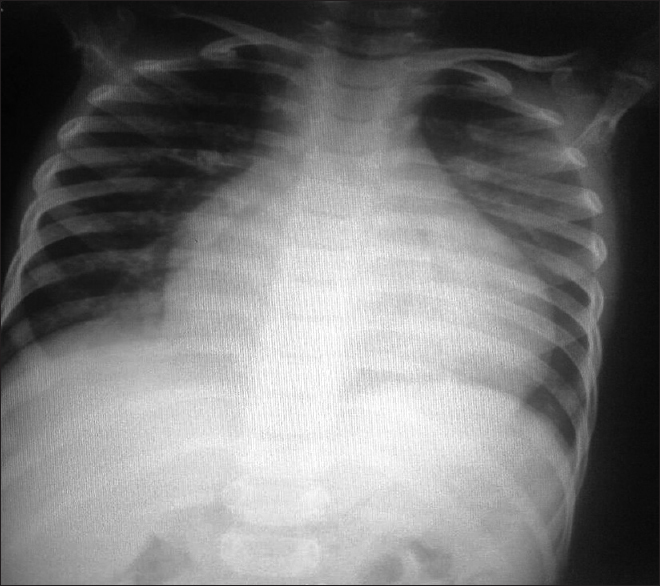 Chest X-ray showed left cardiomegaly [Figure 3]. Two-dimensional echocardiogram showed dilated left ventricle and left atrium, mild mitral regurgitation, and left ventricular dysfunction with ejection fraction of 30%. The child was managed in the Pediatric Intensive Care Unit as cardiac failure. In view of dermatological features of woolly hair, palmoplantar keratoderma associated with the left cardiomyopathy a diagnosis of Carvajal cardio-cutaneous syndrome was considered. Carvajal syndrome wasfirst described by Carvajal-Huerta in Ecuador in 1998. It is considered by some as a variant of Naxos disease. Naxos disease an autosomal recessive condition wasfirst described by Protonotarios et al. in families originating from the Greek island of Naxos. It presents with woolly hair at birth, palmoplantar keratosis, and arrhythmogenic right ventricular cardiomyopathy. Carvajal syndrome is caused by homozygous mutation in the gene coding for desmoplakin which truncates the C-terminal of the protein and maps to chromosome 6p24. Similar mutation of the desmosomal protein plakoglobin gene truncating the C-terminal of the protein which maps to 17q21 causes Naxos disease with predominantly right ventricular cardiomyopathy and clinical features overlapping with carvajal syndrome. Homozygous nonsense mutation (p.R1267X) and compound heterozygous mutation (c. 2516de14 and c. 3917del4) have been associated with cardio-cutaneous involvement. Woolly hair is present from birth, but palmoplantar keratoderma develops after infancy. Palmoplantar keratoderma is of striate type as compared to diffuse keratoderma seen in Naxos disease. Other features in Carvajal syndrome include follicular keratoses on elbows and knees, face, abdomen and lower limbs, clubbing of fingers, transient pruritic blisters, and psoriasiform keratosis. 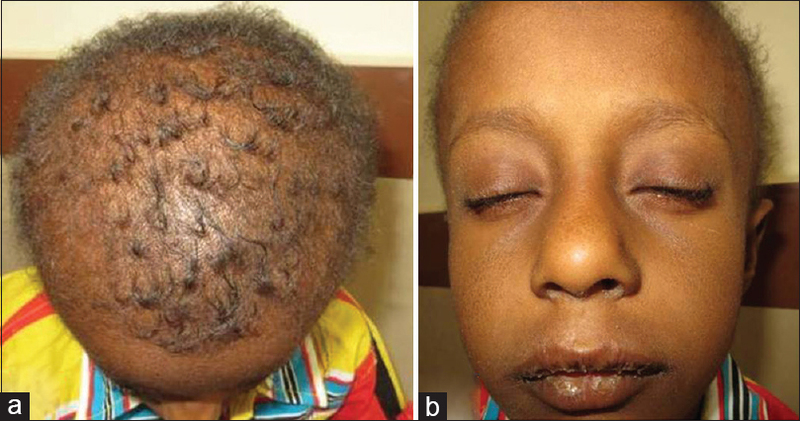 Vesicular acral lesions along with woolly hair, dry skin, and arrhythmogenic right ventricular dysplasia is seen in "Naxos-like syndrome." Left ventricular dilatation is usually asymptomatic at early age, and can be seen only on electrocardiography and echocardiographic examination. Heart failure or sudden death can occur in adolescence. Implantation of automatic cardioverter defibrillator for prevention of sudden cardiac death, antiarrhythmic drugs for prevention of ventricular tachycardia, and treatment of congestive heart failure are possible treatment modalities. Heart transplantation can be considered for end-stage disease. Emollients, topical keratolytics, tazarotene 0.05%, and tretinoin 0.1% can be tried for palmoplantar keratoderma. Any child presenting with woolly hair at birth should be evaluated completely initially only and followed up regularly. The mainstay of treatment is to prevent sudden cardiac death. Early recognition of this entity can prevent mortality. Parents should be counseled about the risk associated with this condition and regular follow-up. Carvajal-Huerta L. Epidermolytic palmoplantar keratoderma with woolly hair and dilated cardiomyopathy. J Am Acad Dermatol 1998;39:418-21. Protonotarios N, Tsatsopoulou A, Patsourakos P, Alexopoulos D, Gezerlis P, Simitsis S, et al. Cardiac abnormalities in familial palmoplantar keratosis. Br Heart J 1986;56:321-6. Norgett EE, Hatsell SJ, Carvajal-Huerta L, Cabezas JC, Common J, Purkis PE, et al. Recessive mutation in desmoplakin disrupts desmoplakin-intermediate filament interactions and causes dilated cardiomyopathy, woolly hair and keratoderma. Hum Mol Genet 2000;9:2761-6. McKoy G, Protonotarios N, Crosby A, Tsatsopoulou A, Anastasakis A, Coonar A, et al. Identification of a deletion in plakoglobin in arrhythmogenic right ventricular cardiomyopathy with palmoplantar keratoderma and woolly hair (Naxos disease) Lancet 2000;355:2119-24. Asimaki A, Syrris P, Wichter T, Matthias P, Saffitz JE, McKenna WJ. A novel dominant mutation in plakoglobin causes arrhythmogenic right ventricular cardiomyopathy. Am J Hum Genet 2007;81:964-73. Alcalai R, Metzger S, Rosenheck S, Meiner V, Chajek-Shaul T. A recessive mutation in desmoplakin causes arrhythmogenic right ventricular dysplasia, skin disorder, and woolly hair. J Am Coll Cardiol 2003;42:319-27. Corrado D, Leoni L, Link MS, Della Bella P, Gaita F, Curnis A, et al. Implantable cardioverter-defibrillator therapy for prevention of sudden cardiac death in patients with arrhythmogenic right ventricular cardiomyopathy/dysplsia. Circulation 2003;108:3084-91.